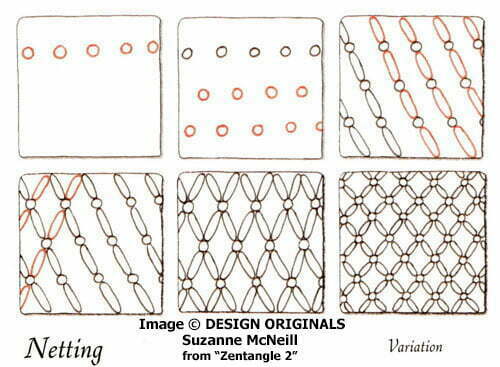 Netting is one of the tangle patterns included in CZT® Suzanne McNeill’s book, Zentangle 2. Netting ends up looking much like a relative of the official Zentangle® pattern Bales, but it isn’t drawn the same way at all. With Netting you create “rice” shapes to obtain the final result and there are no grid lines through the pattern. Check it out here, where Suzanne shows the step-by-step instructions for drawing Netting. UPDATE: Early in the Summer of 2014 Suzanne McNeill’s blog was removed and all the posts and images were lost. The site is being reconstructed as much as possible but the links will no longer be the same. Image © DESIGN ORIGINALS by Suzanne McNeill and used with permission, ALL RIGHTS RESERVED.Please feel free to refer to the step outs to recreate this tangle in your Zentangles and ZIAs, or link back to this page. However the artist and TanglePatterns.com reserve all rights to these images and they should not be pinned, reproduced or republished. Thank you for respecting these rights. It looks to me to be very similar to Suzanne’s Lace Curtains tangle pattern but without the black circle on alternating rows! That’s another lovely pattern.